Rwanda conducted its latest and the 4th Population and Housing Census (PHC) in August 2012. In this massive exercise, around 16,700 enumerators, each one assigned to one of the Enumeration Areas (EAs), visited every household in the country. The fieldwork, consisting of household listing and data capturing lasted for 18 days and was required to be closely monitored for any significant deviations from the planned exercise. A dedicated Command and Control Center was setup at the National Institute of Statistics of Rwanda (NISR), specifically for this purpose. To support its work however, a system of constant communication between this center and field level actors was required. 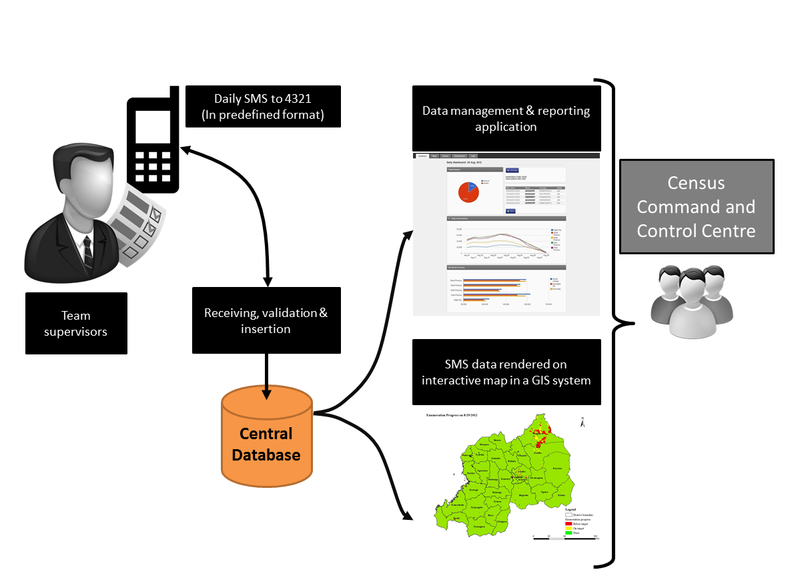 With ubiquitous mobile coverage in Rwanda, it was the obvious choice when I conceptualized a SMS based system using mobile phones to monitor the work of household listing and enumeration on an ongoing basis. 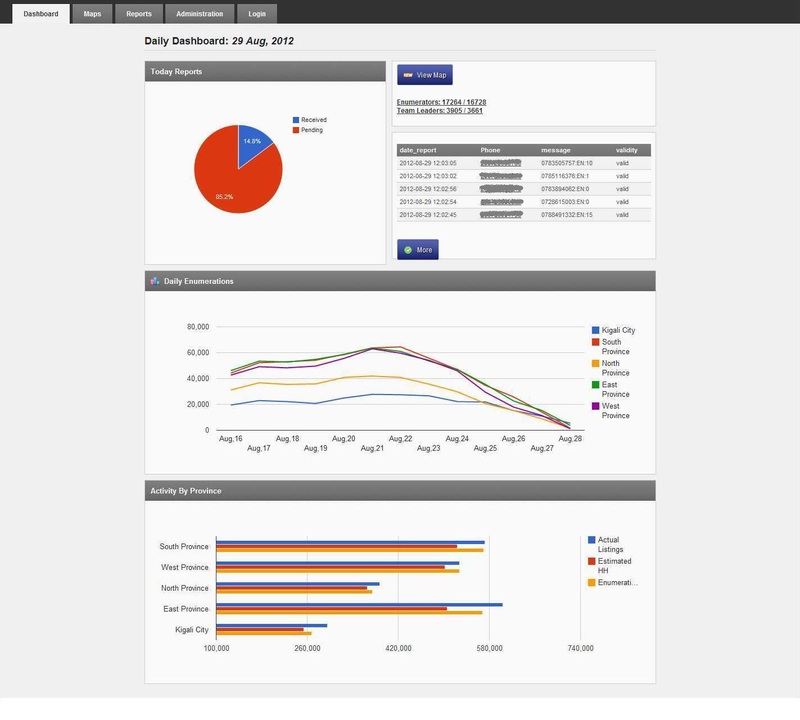 Following is the screenshot of the web interface designed as a dashboard for SMS based real-time monitoring using mobile phones of house-by-house data collection. SMS messages in predetermined formats were sent from field by the team supervisors (each one supervised on average five-six enumerators) every day from their mobile phones to a short code. These were captured and rendered on a web browser based interface to spot any anomalies in expected work. This information was also layered on an interactive map on the browser with specified delimiters. For the first three days of the exercise, the system monitored and reported on the work of enumerators in listing of the households in all EAs. After which, the enumerators started the interviews and collected household data. Each enumerator had a predetermined number of households to be covered every day. The system provided the functionality to print detailed reports/maps for further discussions within NISR. The system had the details about the geographic areas including EAs and personnel data such as mobile phone numbers and names of enumerators and their supervisors for follow-up calls and messages. The software coding for the system was done by outstanding @cuwajeneza using, Open Source tools such as Kannel (SMS gateway), Yii (PHP framework) and MySQL database. The interface was done in HTML5. This was definitely a big improvement on more traditional systems of reporting (such as through phone calls/fax) commonly used in such circumstances, but with this experience, I realized that not only there is a huge potential of extending this arrangement for other surveys as a component of effective survey management, but also, this can be used for monitoring of various government schemes specially in terms of effective public service delivery!